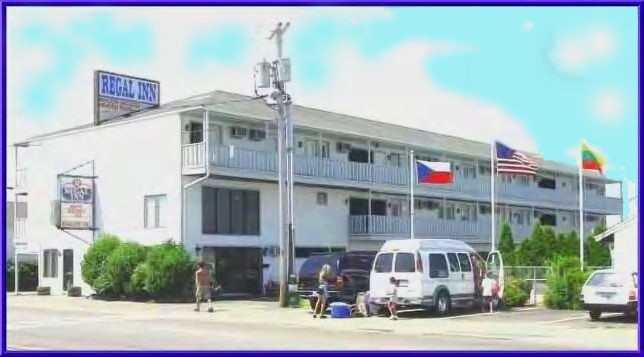 "“Good value, walking distance from the beach.” The Regal Inn was more than I bargained for. I drove up from Boston with my wife and 3 year old son, and when we arrived was pleasantly greeted and led to my room. The room was well furnished, everything was clean and orderly with plenty of fresh towels and and soaps in the bathroom. The television worked fine, although the channels were local only, we found some cartoons to keep my son occupied The bed was very comfortable and when we requested an extra pillow, they bought two. A short walk from the beach makes this hotel very convenient to those wanting to spend time on Hampton beach. Great experience." "“Excellent Location, clean rooms, great service and reasonable price” Very friendly staff, great service and clean rooms. Reasonable price and great location." "looking forward to staying with you!" "looking forward to staying here soon." "We enjoyed our stay there last summer. Close to beach which is a plus with us." "Your accomodations is exactly what we are looking for, for our July vacation." "We've stayed at the Regal for the past few years and keep returning. The prices are very reasonable and staff is wonderful. We'll be returning again this summer ! Can't wait to jump in the pool :)"
"always have a blast at the beach!" "Looking for a place to stay in July"
"stayed at the hotel over the last 3yrs....very happy with everything and wonderful staff"
"looking to vacation here in June...any specials?" "Just happened to find this page...by accident. BUT, this is the location that I grew up at when I was a child. Back in the late 1960's...do I know this pool? Or is this a more recent site? Thanks pretty cool to find this page"
"Once, again, this summer, looking to book at the Regal Inn in August--great location, reasonable rates, convenient--can't wait to return!" "looking for a place for seafood fest heard your great to stay"
"Great Location, Convenient, excellent rates--looking forward to returning this summer!" "Looking forward to spending my birthday weekend at your inn." "Used to stay at the Regal when my children were small. We LOVED our vacations at Hampton Beach! Thinking of returning this summer." "cant wait to come! this will b our first year staying in hampton (my 6year old daughter and I) see you soon!" "Looking forward to our weekend visit!" "My husband and I had a very nice romantic stay last year and we are looking forward to returning!" "hoping to visit in the summer 2012 either in august early or even the 1st week of september"
"I have been going to NH for the past 10YR with the hole Fam and since have stay at Regal inc love the service and how clean it is i will defenaly recomend it for a couple as well as family it has differnce type of rooms like Appt for the hole Fam or just for a couples, ect the best place!" "Would love to stay here in aug"
"I look foreward to staying with you!!" "i have friends that stay there every year. they highly recommend you. we usuall stay in seabrook but r considerig staying with u we have 2 adults and 3 children thinking sometime middle of aug"